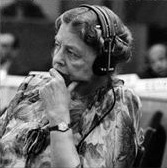 In February 1947, in accordance with a decision from the first session of the Commission on Human Rights (E/259), a group consisting of Eleanor Roosevelt, Pen-Chun Chang and Charles Malik, began drafting the International Bill of Human Rights. With assistance of the UN Secretariat, the task of formulating a preliminary draft was given to John Humphrey, Director of the UN Secretariat's Division for Human Rights. Following a letter from the Chairman of the Commission on Human Rights to the President of the Economic and Social Council, dated 27 March 1947, (E/383), this Drafting Committee was enlarged to include representatives of Australia, Chile, France, the Soviet Union and the United Kingdom, in addition to the representatives of China, France, Lebanon and the United States. First lady of the United States of America from 1933 to 1945, Mrs. Eleanor Roosevelt was appointed, in 1946, as a delegate to the United Nations General Assembly by United States President Harry S. Truman. She served as the first Chairperson of the UN Human Rights Commission and played an instrumental role in drafting the Universal Declaration of Human Rights. At a time of increasing East-West tensions, Mrs. Roosevelt used her enormous prestige and credibility with both superpowers to steer the drafting process towards its successful completion. In 1968, she was posthumously awarded the UN Human Rights Prize. Playwright, philosopher, educator and diplomat, Mr. Peng-chun Chang, was well known in his country as a director of Chinese modern drama. He was able to explain Chinese concept of human rights to the other delegates and creatively resolved many stalemates in the negotiation process by employing aspects of Confucian doctrine to reach compromises between conflicting ideological factions. He insisted, in the name of universalism, on the removal of all allusions to nature and God from the Universal Declaration of Human Rights. Philosopher and diplomat, Mr. Charles Habib Malik pursued an academic career in philosophy at Harvard University and founded the philosophy department at the American University of Beirut. He was also a theologian who successfully reached across religious lines, appealing to his fellow Eastern Orthodox Christians, Roman Catholics and Evangelicals alike. He represented Lebanon at the San Francisco conference at which the United Nations was founded. He served as President of the Economic and Social Council and as Chair of the Third Committee during the 1948 debates on the Universal Declaration of Human Rights. Mr. Malik was a major force in the debates surrounding key provisions of the Declaration. He also played a critical role in explaining and refining some of its basic conceptual issues. He returned to his academic career in 1960 and lectured on human rights at universities in the United States. A veteran of World War I and a diplomat, Mr. William Hodgson occupied numerous positions in the Australian Government and attended the San Francisco Conference that founded the United Nations as an advisor to the Australian delegation. Mr. Hodgson advocated strongly for a multilateral convention on human rights and the establishment of an international court to implement that convention. An educator and judge, Mr. Santa Cruz taught criminal and military procedures at various military academies and became a judge on Chile's Superior Military Court. A member of Chile's UN delegation, Mr. Santa Cruz supplied one of the initial drafts which was worked on by John Humphrey of Canada, Director in the UN Division of Human Rights. Mr. Santa Cruz, during the drafting stages, was vigilant in his defense of socio-economic rights and put forward persuasive arguments for their inclusion when North Atlantic nations sought to leave them out of the draft document. He was actively involved in the establishment of the United Nations Economic Commission for Latin America and the Caribbean. Jurist and judge, René Cassin was a key player in the deliberations held throughout the three sessions of the Commission on Human Rights, as well as those of the Commission's Drafting Committee. The son of a Jewish merchant, Mr. Cassin's involvement in the drafting of the Universal Declaration and his other human rights work, for which he received the Nobel Peace Prize in 1968, were significantly informed by his personal response to the Holocaust. He served as a member (1959-1965) and President (1965-1968) of the European Court of Human Rights. Today the court building stands in his honour on the Rue René Cassin in Strasbourg. Mr. Bogomolov taught at the Moscow State University until 1939 when he began his diplomatic career. He participated in the drafting process of the Universal Declaration while he was the Ambassador of the U.S.S.R. to France. Later, he became the Ambassador to Czechoslovakia (1952-1954), and to Italy (1957). Charles Dukes was a trade unionist who had a successful career in the British Trade Unions Congress General Council and became its President in 1946. While he represented his country during the first and second sessions of the Commission on Human Rights, he participated in the drafting of the Universal Declaration as well as a legally-binding convention, the title of which would eventually be the International Covenant on Human Rights. International lawyer. Mr. Humphrey carried the main responsibility for gathering and analyzing the background documents that informed the Commission's work. His 408-page "Documented Outline" formed the basis for subsequent debates and considerations of the Commission on Human Rights and the Drafting Committee as they drafted the Universal Declaration. With a broad range of interests, such as politics, commerce and art, as well as his fluency in English and French, Mr. Humphrey served as an important link between English-speaking and French-speaking cultural perspectives, between scholars and pragmatists, and between politicians and civil servants. He spent more than 20 years at the UN tirelessly advocating for those in need of rights protection.